This challenge was fun to do. 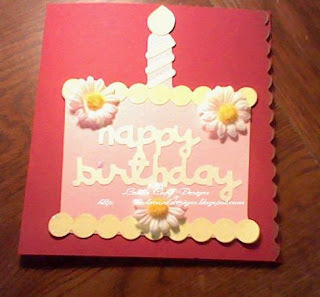 I had to make a card for my Mother for her 65Th Birthday. This one was challenging because it's different now without my Father around. I really miss him. As I said this was a challenge. We were invited to a cousin's home for a celebration of my Mother's birthday. My cousin's knew I made fancy cakes because I make them for my son on his birthday's every year. They also know I make cards hence my purchasing one for this birthday was just simply out of the question. I had to come up with something sweet for her. This is what I came up with and she really loved it. I wanted it to be special because we have had many losses in our family recently. I do apologize for the lighting. This was the best that I could do. I was also using a Nintendo DSi for the pictures so I guess with that being said it's what I got. Along the scalloped edge is gold inking that my Mother absolutely loved. Thank you so much for looking. Awesome job! Love the card. Love your blog too. I'm now your newest follower. I would love for you to stop by and visit my blog sometime. 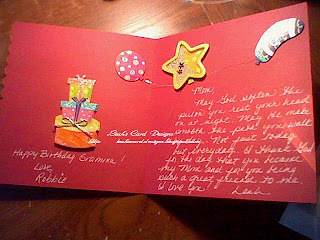 It's a beautiful card and I know it meant a lot to your Mother.